Vitria OI is designed to continuously ingest massive volumes of both streaming and stored data. 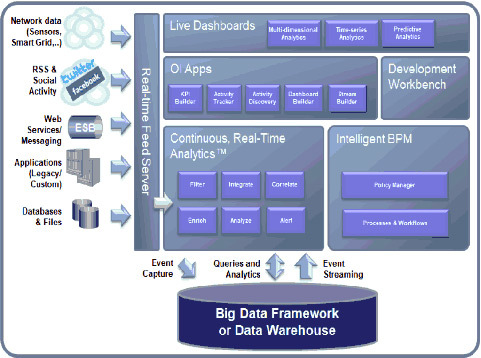 The high performance complex event processing (CEP) engine within it continuously queries, filters, correlates, integrates, enriches and analyzes this data to discover exceptions, patterns, and trends that are presented through live dashboards. By leveraging in-memory processing, the results are delivered with ultra-low latency. The ability to easily mash up these results with external data and event sources helps deliver real-time insights in context. Advanced multi-dimensional, time-series and predictive analyses present business executives with the “big picture” and the ability to drill into specific events and take immediate process-based corrective action. The innovative OI Apps let business executives configure KPIs and zero-code dashboards in minutes. More sophisticated OI applications, complete with feeds, CEP queries, processes, policies and dashboards, can be graphically composed by IT architects using the Development Workbench. 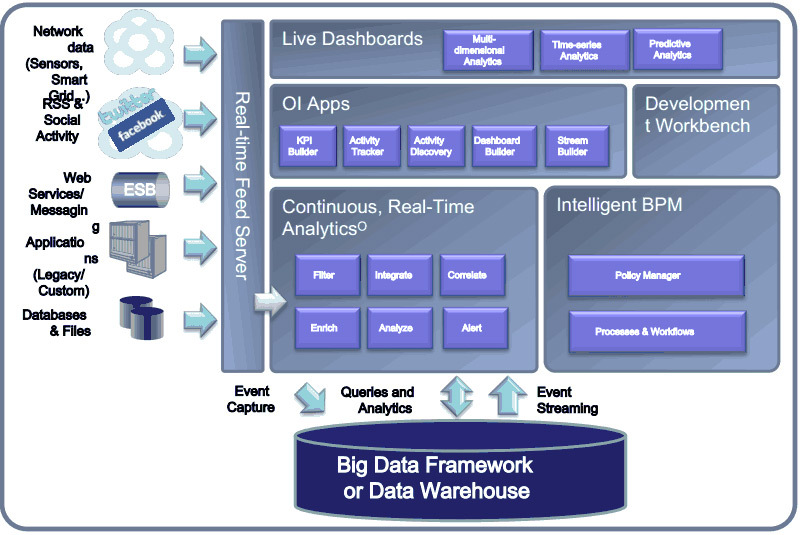 Read how Vitria OI for streaming Big Data analytics complements BI systems. Delve into the inner workings of Vitria’s streaming analytics solution.